Background and objectives Regulatory agencies warn about the risk of AKI with levetiracetam use on the basis of information from case reports. We conducted this study to determine whether new levetiracetam use versus nonuse is associated with a higher risk of AKI. Design, setting, participants, & measurements This was a population-based retrospective cohort study of adults with epilepsy in Ontario, Canada. Patients who received a new outpatient prescription for levetiracetam between January 1, 2004 and March 1, 2017 were matched to two nonusers on stage of CKD, recorded seizure in the prior 90 days, and logit of a propensity score for levetiracetam use. The primary outcome was a hospital encounter (emergency department visit or hospitalization) with AKI within 30 days of cohort entry. Secondary outcomes were AKI within 180 days and change in the concentration of serum creatinine. We assessed the primary outcome using health care diagnosis codes. We evaluated the change in the concentration of serum creatinine in a subpopulation with laboratory measurements. Results We matched 3980 levetiracetam users to 7960 nonusers (mean age 55 years, 51% women). Levetiracetam use was not significantly associated with a higher risk of AKI within 30 days (13 [0.33%] events in levetiracetam users and 21 [0.26%] events in nonusers [odds ratio, 1.24; 95% confidence interval, 0.62 to 2.47]). Similarly, there was no significant association with AKI within 180 days (odds ratio, 0.70; 95% confidence interval, 0.43 to 1.13). The change in the concentration of serum creatinine did not significantly differ between levetiracetam users and nonusers. Conclusions In this population-based study levetiracetam use was not associated with a higher risk of AKI. Levetiracetam (trade name Keppra) is a popular second generation antiepileptic drug, with annual worldwide sales approximating $1 billion United States dollar (1). It is often used adjunctively with other antiepileptic drugs, is highly bioavailable, undergoes little metabolism, and is excreted by the kidneys with dose adjustment recommended in CKD (2,3). Levetiracetam has no reported clinically significant interactions with other antiepileptic drugs, and is perceived to have a more favorable adverse effect profile than other antiepileptic drugs (2). The most common adverse events reported with levetiracetam are somnolence, asthenia, dizziness, headaches, and behavioral changes (4). Although the risk of AKI was not identified in randomized, controlled trials of levetiracetam use (Supplemental Table 1), postmarketing surveillance has identified a possible association between levetiracetam and AKI. In 2016 the World Health Organization issued a warning linking levetiracetam use with 150 cases of AKI, including 49 cases of interstitial nephritis (5). A detailed review of 39 cases of AKI established a possible causal relationship in nine cases, with a median onset of AKI 27 days from drug initiation. Regulatory agencies in the United States, Canada, Europe, and Japan have issued warnings about the risk of AKI with levetiracetam use, which have resulted in changes in product monograph warnings (Supplemental Table 2). In January of 2017, the US Food and Drug Administration noted a potential safety signal in the Federal Adverse Event Reporting System (Supplemental Table 2). At the same time, Health Canada conducted a safety review and recommended that the risk of AKI be listed in all levetiracetam product monographs (Supplemental Table 2) (6). We performed a search of bibliographic databases and identified only eight studies, all case reports, that suggested a greater risk of AKI with levetiracetam (Supplemental Table 3). In these reports, four cases of AKI were attributed to interstitial nephritis, two to rhabdomyolysis, and one to a pharmacokinetic interaction with methotrexate (7–14). Therefore, to provide additional safety data we conducted this population-based cohort study to determine whether levetiracetam use is associated with a higher risk of AKI compared with nonuse. We conducted a population-based, retrospective cohort study using linked health care databases in Ontario, Canada between January 1, 2004 and March 1, 2017. Ontario has approximately 13.5 million residents who have universal access to hospital care and physician services, with individuals 65 years of age or older also receiving universal drug coverage (14% of the population or 1.9 million persons). Individuals under the age of 65 are eligible for universal drug coverage if they receive disability support, receive social assistance, or have high drug costs relative to their income. This study was approved by the institutional review board at Sunnybrook Health Sciences Centre, Toronto, Canada. These datasets were linked using unique encoded identifiers and analyzed at the Institute for Clinical Evaluative Sciences (ICES). The full dataset creation plan and underlying analytic code are available from the authors upon request, understanding that they may rely upon coding templates or macros that are unique to the ICES environment where the study was conducted. The reporting of this study followed the Strengthening the Reporting of Observational Studies in Epidemiology guidelines (Supplemental Table 4) (15). We ascertained patient characteristics, drug use, covariate information, and outcome data using records from eight linked databases. We obtained vital statistics from the Ontario Registered Persons Database, which contains demographic information on all Ontario residents ever issued a health card. We used the Ontario Drug Benefit program database to determine prescription drug use. This database contains accurate records of all dispensed outpatient prescriptions, with an error rate of 0.7% (16). We identified diagnostic and procedural information on all hospitalizations and emergency department visits from the Canadian Institute for Health Information Discharge Abstract Database and National Ambulatory Care Reporting System database, respectively. We obtained covariate information from the Ontario Health Insurance Plan database, which includes health claims for physician services. We used the ICES Physician Database to ascertain levetiracetam prescriber information. In a subpopulation, we obtained serum creatinine laboratory measurements using data from the Ontario Laboratory Information System. We have previously used these databases to research adverse drug events including AKI (17–22). International Classification of Diseases, ninth revision (ICD-9; pre-2002) and 10th revision (ICD-10; post-2002) codes were used to assess baseline comorbidities in the 5 years before receipt of a prescription (Supplemental Table 5). Only ICD-10 codes were used to ascertain outcomes, because all outcomes would have occurred after implementation of this coding system in 2002 (Supplemental Table 6). Comorbidities were evaluated using the Adjusted Clinical Group scoring system with the Johns Hopkins Adjusted Clinical Group System Version 10 (23). Databases were complete for all variables used except for levetiracetam prescriber data (18% missing) and income data (0.4% missing). The only reason for lost follow-up was emigration from the province, which occurs in <0.2% of the population each year and was not assessed in this study (24). We established a cohort of patients in Ontario, Canada with evidence of a new outpatient prescription dispensed for oral levetiracetam (levetiracetam users). The date of dispensing served as the start date for follow-up, also referred to as the index date. As a referent group we identified a group of adult patients from the Ontario population who had never received a prescription for levetiracetam before a randomly assigned index date (levetiracetam nonusers). We did not choose another antiepileptic medication as a comparator because levetiracetam is often used adjunctively, and instead aimed to have similar baseline antiepileptic drug use in both groups. From both the user and nonuser groups we excluded the following patients: (1) age<18 years on index date, (2) evidence of a prescription for levetiracetam in the 180 days before the index date (to ensure that these were new prescriptions), (3) patients with no evidence of a drug prescription in the 120 days before index date (to ensure eligibility and active use of the provincial universal drug benefit program), (4) those who had a hospital discharge or emergency department visit in the 2 days before index date (to ensure these were new outpatient levetiracetam prescriptions), (5) those with a history of ESKD, and (6) those with no evidence of epilepsy defined by no evidence of any of the following: a hospital encounter for seizure, electroencephalography in the prior 5 years, or a prescription for an antiepileptic in the prior 120 days (to capture both outpatient and hospital encounters with epilepsy). Patients with multiple eligible study prescriptions were restricted to the first eligible study prescription. We assessed the primary outcome of a hospital encounter (emergency department visit or hospital admission) with AKI within 30 days after the index date, because most case reports describe AKI events from levetiracetam within this period. The primary outcome was assessed with an ICD-10 diagnosis code (Supplemental Table 6). In Ontario, we previously demonstrated that this AKI code identified a median increase in serum creatinine of 1.50 mg/dl at the time of emergency department visit (25th to 75th percentile, 0.70–3.26) above the most recent value (25). Although the specificity is >95%, the sensitivity of the AKI code is limited for milder forms of the condition. The incidence of AKI, as defined by the diagnosis code, can be underestimated up to five-fold compared with definitions using serum creatinine measurements. Therefore, we also examined a subpopulation with linked laboratory values as described below. We assessed a hospital encounter with AKI within 180 days after the index date. This was done to account for any delay in the development of AKI and to account for any susceptibility levetiracetam may confer to other AKI insults over time (i.e., two-hit hypothesis). To gain insights into the possible causes and severity of AKI, we assessed for a diagnosis of acute interstitial nephritis, rhabdomyolysis, receipt of acute dialysis, kidney biopsy, or a nephrologist consultation within 180 days after the index date (codes are presented in Supplemental Table 6). In a subpopulation of patients with serum creatinine measurements taken before and within 180 days after the index date, we defined AKI as evidence of an increase in concentration of serum creatinine value by ≥0.3 mg/dl or a ≥50% increase in the follow-up compared with preindex date baseline value, which are the laboratory thresholds used to define AKI in the Kidney Disease Improving Global Outcomes classification system (26). In addition, we compared the absolute and percentage change in serum creatinine between the two groups. We estimated baseline eGFR using the Chronic Kidney Disease Epidemiology Collaboration equation (27). Using a logistic regression model, we derived propensity scores for the predicted probability of receiving a new outpatient prescription for levetiracetam. Using a greedy matching algorithm without replacement, one levetiracetam user was matched to two nonusers on stage of CKD, whether they had a hospital encounter for epilepsy or seizure in the prior 90 days, and the logit of the propensity score for levetiracetam use (within a caliper width of 0.2 SD). Propensity score matching was used to ensure that user and nonuser groups were balanced on a wide range of measured baseline characteristics (variables included are provided in Supplemental Table 7). A 1:2 matching ratio was selected to maximize statistical power while minimizing the loss of levetiracetam users. We used standardized differences to compare baseline characteristics between users and nonusers, with a value >10% indicating imbalance (28–30). We used conditional logistic regression to estimate odds ratios (ORs) and 95% confidence intervals (95% CIs). In all outcome analyses we interpreted two-tailed P values <0.05 as statistically significant. To comply with ICES privacy regulations to minimize the chance of identifying a patient, numbers of patients were suppressed in the case of 1–5 patients (reported as ≤5). We performed all analyses using SAS version 9.4 (SAS Institute, Cary, NC). The creation of our cohort is shown in Figure 1. From 2004 to 2017, there were 4980 levetiracetam users and 1,413,139 nonusers eligible for the study. Before matching, levetiracetam users compared with nonusers were more likely to be younger and have greater comorbidity, and had a greater number of hospitalizations and emergency department visits in the baseline period (Table 1). Cohort selection with inclusion and exclusion criteria. We identified 3980 new levetiracetam users and matched them in a 1:2 ratio to 7960 levetiracetam non-users by CKD stage, hospital encounter with seizure in the prior 90 days, and a logit of the propensity score for levetiracetam use. ED, emergency department. We matched 3980 (79.9%) of our original cohort of levetiracetam users to 7960 levetiracetam nonusers. The two groups were well balanced on >100 different characteristics including patient demographics, comorbidities, concurrent medication use (including antiepileptics), health care contacts, and health care use. Standardized differences were <10% across all characteristics measured except for brain cancer and multiple sclerosis, which were 11% (Table 1). Among levetiracetam users, the median (25th to 75th percentile) age was 55 (36–73) years, and 60.4% of levetiracetam users were aged ≤65 years. Continuous use was defined as consecutive prescription claims within a period equivalent to 150% of the days supplied for the previous prescription. The median (25th to 75th percentile) duration of continuous prescriptions for levetiracetam users in follow-up was 287 (84–827) days. Levetiracetam users who were successfully matched to nonusers were less likely to have had a seizure in the prior 90 days compared with nonmatched levetiracetam users (Supplemental Table 8). Levetiracetam use compared with nonuse was not significantly associated with a higher 30-day risk of hospital encounter with AKI, with 13 (0.33%) events in levetiracetam users versus 21 (0.26%) events in nonusers (OR, 1.24; 95% CI, 0.62 to 2.47; P=0.55) (Table 2). Levetiracetam use compared with nonuse was also not significantly associated with a higher 180-day risk of hospital encounter with AKI (Table 2). At 180 days there were 23 (1.15%) events in levetiracetam users and 65 (1.63%) events in nonusers (OR, 0.70; 95% CI, 0.43 to 1.13; P=0.15). Among the 23 patients with AKI in the levetiracetam group followed for 180 days from the index date, none were taking methotrexate or had a concurrent recorded diagnosis of rhabdomyolysis. When the 3980 levetiracetam users were followed for 180 days, no patients received acute dialysis, ≤5 (≤0.1%) had a hospital encounter with a diagnosis of acute interstitial nephritis, and ≤5 (≤0.1%) received a kidney biopsy. After extending follow-up to 365 days, the number of acute interstitial nephritis diagnoses remained ≤5 (≤0.1%) in the levetiracetam users. The risk of a hospital encounter with rhabdomyolysis (without the need for a concurrent recorded diagnosis of AKI) was not significantly different in levetiracetam users compared with nonusers over a period of 180 days after the index date (10 [0.50%] events in levetiracetam users and 14 [0.35%] events in nonusers [OR, 1.43; 95% CI, 0.64 to 3.22; P=0.39]). Over this same period there was also no significant difference between the two groups in the likelihood of having a nephrology consultation (36 [1.80%] events in levetiracetam users and 62 [1.55%] events in nonusers [OR, 1.17; 95% CI, 0.77 to 1.77; P=0.47]). Levetiracetam use compared with nonuse was not significantly associated with a higher risk of AKI in the subpopulation with serum creatinine values (Table 3). A baseline creatinine value was available in 619 (15.5%) patients in the levetiracetam group, of which 509 (82.2%) were matched to levetiracetam nonusers who also had a baseline creatinine value. Within this subset, standardized differences were well balanced (Supplemental Table 9). Median baseline creatinine was 0.77 mg/dl in levetiracetam users and 0.79 mg/dl in nonusers. The baseline creatinine was measured a median (25th to 75th percentile) of 179 (65–297) days before the index date. In this cohort, 67 of 509 levetiracetam users (13.2%) had a baseline eGFR<60 ml/min per 1.73 m2. At 30 days the OR for AKI on the basis of laboratory measurements was 1.25 (95% CI, 0.41 to 3.82; P=0.70). Similarly, at 180 days there were 19 (3.73%) AKI events in levetiracetam users by serum creatinine measurements and 27 (2.65%) events in nonusers (OR, 1.44; 95% CI, 0.78 to 2.66; P=0.24). There were 151 levetiracetam users and 275 nonusers who had a baseline serum creatinine measurement and at least one measurement within 180 days of follow-up. 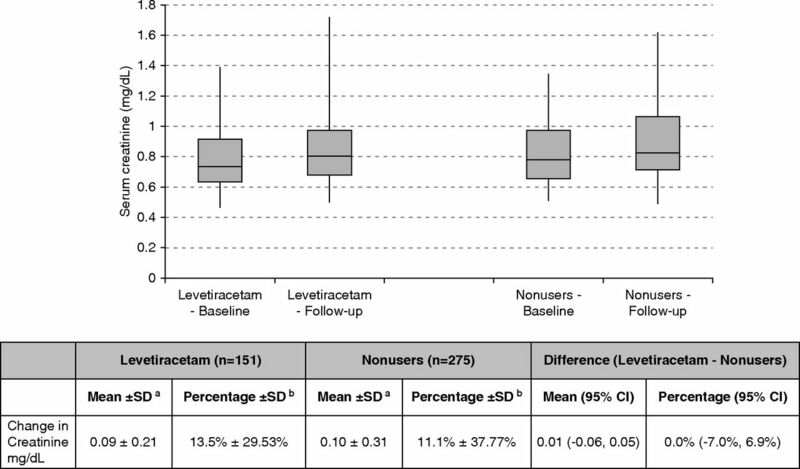 The mean (±SD) rise in the concentration of serum creatinine in the 180 days after the index date was 0.09±0.21 mg/dl in levetiracetam users and 0.10±0.31 in nonusers with an absolute difference between the groups of 0.01 (95% CI, −0.06 to 0.05; P=0.86) (Figure 2). Changes in serum creatinine level within 180 days of levetiracetam use. No significant differences were observed between baseline and follow-up serum creatinine levels in both levetiracetam users and non-users. aChange in serum creatinine was defined as the peak serum creatinine concentration in the 180 days after the index date minus the baseline serum creatinine concentration. Peak serum creatinine concentration may have been measured in an outpatient laboratory, emergency department, or hospital setting. bPercentage change defined as: ([peak serum creatinine concentration in the 180 days after the index date]−[baseline serum creatinine concentration])/baseline serum creatinine concentration×100. 95% CI, 95% confidence interval. In this population-based cohort study we found no significant association with new levetiracetam use and the risk of AKI. This finding was consistent in our primary and secondary analyses. Our results suggest that those who developed AKI were not at serious risk, because no individuals in the levetiracetam group received acute dialysis. Our results are consistent with the findings from prior randomized and open-label trials, which did not describe a significant risk of AKI with levetiracetam (Supplemental Table 1). Only a single case of kidney failure was noted in the largest postmarketing open-label trial, which included 1541 patients on levetiracetam (31). On the basis of case reports, interstitial nephritis, rhabdomyolysis, and interaction with methotrexate have been proposed as potential mechanisms of levetiracetam-associated AKI. Given the findings of our population-based study, we evaluated the quality of the case reports associating levetiracetam use with AKI (Supplemental Table 10) (32). On the basis of the Naranjo algorithm, which we used to determine the likelihood that an adverse reaction was secondary to levetiracetam, all case reports fell in the category of “probable adverse drug reaction” (33). Two of the four case reports attributing acute interstitial nephritis to levetiracetam use had biopsy confirmation (9,10), whereas another case attributed hypokalemia and hypomagnesemia to an acquired kidney tubular disorder secondary to levetiracetam use (34). The product monograph for levetiracetam lists nephritis as a possible manifestation associated with Drug Reaction with Eosinophilia and Systemic Symptoms. In our study levetiracetam use was not associated with a higher risk of acute interstitial nephritis when patients were followed for 365 days. Rhabdomyolysis is a known cause of AKI (35). In our study, the incidence of rhabdomyolysis was not significantly different in levetiracetam users compared with nonusers. None of the levetiracetam users who developed AKI had evidence of rhabdomyolysis. Rhabdomyolysis with levetiracetam use has been documented in nine case reports in the literature (Supplemental Table 11), within 2 weeks of drug initiation, and with a higher prevalence reported in Japanese patients (7,13,36–42). Although prolonged seizures can independently cause rhabdomyolysis, two case reports of AKI have been attributed to rhabdomyolysis secondary to levetiracetam use (7,13). High-dose methotrexate is known to cause AKI either through crystal deposition or direct kidney tubular injury. Health Canada issued a warning in October of 2016 regarding a possible drug interaction between methotrexate and levetiracetam that could result in acute kidney failure (43). Methotrexate is excreted through the kidneys, and a case of delayed methotrexate elimination with coadministration with levetiracetam resulting in kidney failure has been reported (44). A subsequent retrospective study in 81 patients by the same group did not support this interaction (45). None of the levetiracetam users who developed AKI in our study were using methotrexate. Our study has several strengths. This is the first large observational study to investigate the association between levetiracetam use and AKI. It included 3980 levetiracetam users, which is 13-times larger than the number of patients taking levetiracetam in the largest randomized trial (46). Furthermore, we included patients excluded from prior studies such as those with CKD. We acknowledge that our study has limitations. A small number of events meant some estimates were imprecise, with inadequate statistical power to detect a small difference in risk. We did not have data on medications used in hospital and did not study levetiracetam use initiated in hospital. In our region levetiracetam is most often used adjunctively and we did not conduct a study of patients with new onset epilepsy who initiated levetiracetam as their first antiepileptic treatment. In addition, a dose-dependent effect was not evaluated. Only a limited number of patients had baseline and follow-up laboratory measurements available for analysis, reducing our precision to detect differences in risk for milder AKI. Follow-up laboratory measurements were assessed retrospectively in routine care rather than by a standardized protocol. Despite this, the lack of any appreciable AKI risk with levetiracetam was consistent in all of the analyses performed. In conclusion, the findings from our population-based study do not support an association between levetiracetam use and risk of AKI. Currently, the risk of AKI is labeled in Canadian and American levetiracetam product monographs as a postmarketing adverse event. Popular prescribing references such as Lexicomp list kidney failure as an adverse event <1% of the time. Although this study found no association between new levetiracetam use and AKI, there was inadequate statistical power to detect a rare idiosyncratic event. At this time, for patients presenting with serious AKI while taking levetiracetam, all other causes should be excluded before carefully considering levetiracetam as a potential cause. Supplemental Table 1. Summary of Renal Adverse Events from Major Studies on Levetiracetam. Supplemental Table 2. Current Warnings for Levetiracetam Relevant to Acute Kidney Injury. Supplemental Table 3. Summary of Case Reports of Acute Kidney Injury Associated with Levetiracetam Use. Supplemental Table 4. Checklist of recommendations for reporting of observational studies using the REporting of studies Conducted using Observational Routinely-collected health Data (RECORD) guidelines. Supplemental Table 5. Coding Definitions for Demographic and Comorbid Conditions. Supplemental Table 6. Coding Definitions Used to Define Outcomes. Supplemental Table 7. Variables Included in the Propensity Score Model. Supplemental Table 8. Baseline Characteristics of Levetiracetam Users Not Matched versus Matched in Study. Supplemental Table 9. Baseline Characteristics in Subpopulation with Laboratory Data After Propensity Score Matching. Supplemental Table 10. Case Report Checklist Ranking of Case Reports for Acute Kidney Injury. Supplemental Table 11. Case Reports of Rhabdomyolysis Associated with Levetiracetam Use. Supplemental Table 12. Levetiracetam Dosage Recommendations. This study was supported by the Institute for Clinical Evaluative Sciences (ICES) Western site. ICES is funded by an annual grant from the Ontario Ministry of Health and Long-Term Care (MOHLTC). Core funding for ICES Western is provided by the Academic Medical Organization of Southwestern Ontario (AMOSO), the Schulich School of Medicine and Dentistry (SSMD), Western University, and the Lawson Health Research Institute (LHRI). The authors thank IMS Brogan Inc. for use of their Drug Information Database. The research was conducted by members of the ICES Kidney, Dialysis, and Transplantation team, at the ICES Western facility, who are supported by a team grant from the Canadian Institutes of Health Research (CIHR). This specific project was funded through an operating grant from AMOSO. A.X.G. was supported by the Dr. Adam Linton Chair in Kidney Health Analytics and a CIHR Clinician Investigator Award. The opinions, results, and conclusions are those of the authors and are independent of the funding sources. No endorsement by ICES, AMOSO, SSMD, LHRI, or the MOHLTC is intended or should be inferred. Parts of this material are on the basis of data and/or information compiled and provided by the Canadian Institute for Health Information (CIHI). However, the analyses, conclusions, opinions, and statements expressed in the material are those of the authors, and not necessarily those of CIHI. This article contains the following supplemental material online at http://cjasn.asnjournals.org/lookup/suppl/doi:10.2215/CJN.07490618/-/DCSupplemental.